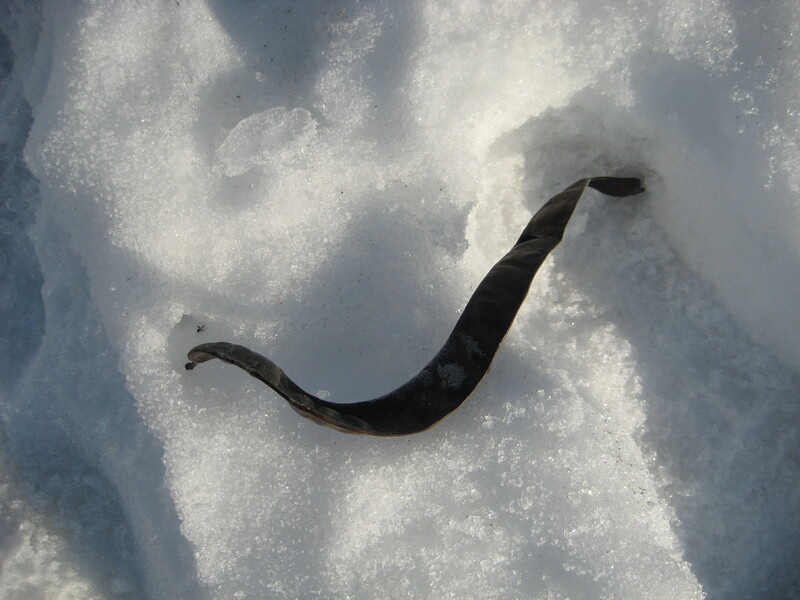 Ever see these weird wiggly worm-like seed pods lying around in a parking lot? 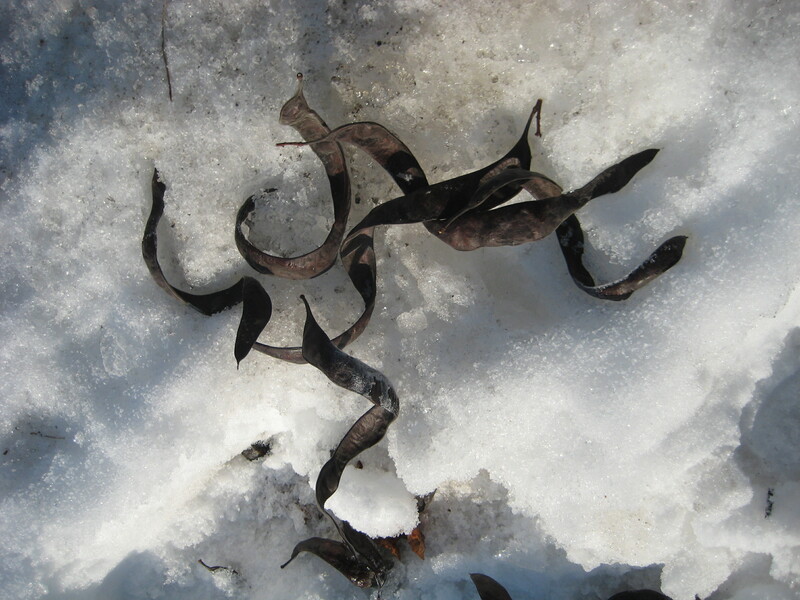 They come from a tree, Honey Locust, Gleditsia triacanthos. The seed pods are a little sweet to taste, that’s where the honey part of the name comes from. They’re occasionally nibbled by deer and squirrels, and were even used as a sugar substitute long ago. The best thing about them, though, is that when you shake the dried pods, they have this great rattly maraca sound. 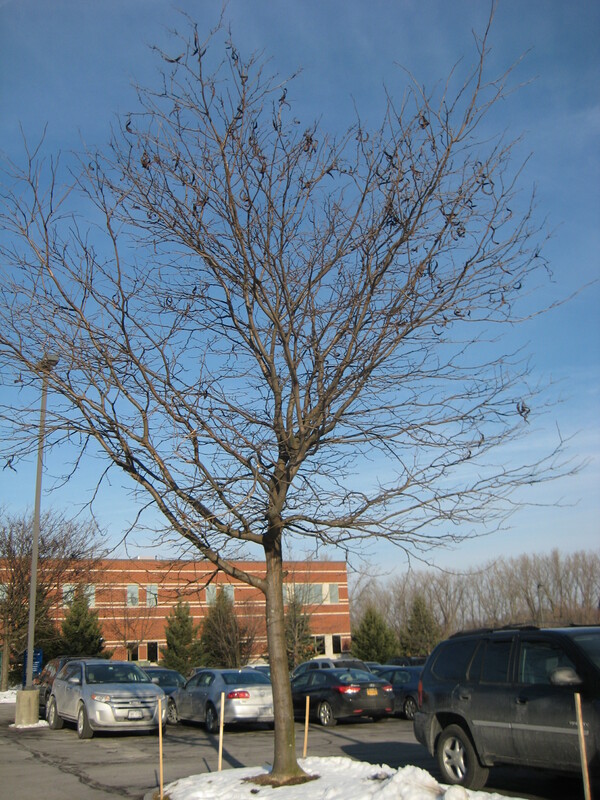 Honey locust is the classic parking lot tree—it flourishes in this odd environment of cement and blacktop because it’s a particularly hardy sort–highly resistant to road salt, air pollution, and heat. Honey Locust is a native American tree, much planted in malls and housing developments because (like them) it’s a fast grower. But there’s something odd about this particular honey locust. Something missing. Back long ago when I first started learning my trees, I encountered a mystery specimen, a completely unidentifiable tree. I stood under it, tree guide in hand, scratching my head. Seemed as though it must be a honey locust—the weird seed pods looked exactly like the illustrations in the book, the leaves were right, everything matched except for one thing—it didn’t have thorns. Every tree guide I consulted agreed that honey locusts have thorns. Big thorns. Not just little prickers, great huge whomping thorns, six inches long and iron hard. Old-time carpenters actually used them as nails. But this tree I was struggling to identify had no thorns, not one. And after much research I finally discovered that it wasn’t Gleditsia triacanthos after all, but Gleditsia triacanthos inermis. A thornless variety of honey locust, especially developed for areas where humans might come into contact with it. Honey locust defanged, as it were. This seems practical and convenient. This is an urban area, not the wilderness, after all. Don’t want sharp thorns in an area where kids might prick themselves. Non-thorny branches are safer. Honey locust pops up not infrequently in Native American stories, probably because the wicked thorns made it a useful bad guy. Indian legends, like all folklore, often have what anthropologists call a “test-theme”–tales in which the hero or heroine has to be tested somehow, achieve something, prove something. And in a long-forgotten Cherokee myth about the Thunder Spirit, the dreadful spines of honey locust are the test. The son turns out to be Thunder’s most dangerous offspring: Lightning. Thunder Man is a crabby sort—he’s often heard growling and grumbling just over the horizon. But he embraces and accepts his son, although forbidding him ever to harm his beloved honey locust tree. The sharp spines of the honey locust were needed in order to perform the crucial test–to weed out the special from the ordinary, to recognize a god. The thorns were, in a way, sacred. 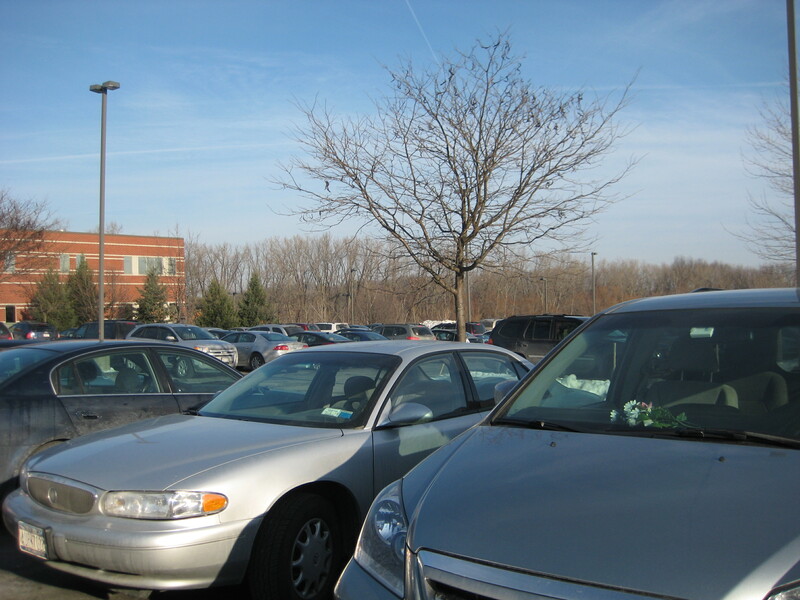 But Thunder Man would be out of luck in this parking lot, where all the branches are smooth as a baby’s bottom. 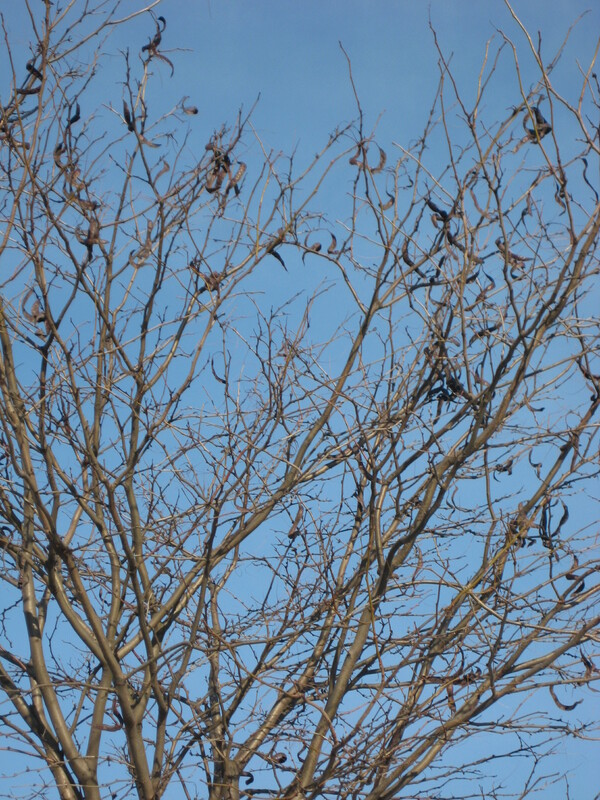 So what do we lose, when we take the thorns off the honey locust? It seems to me it’s a little like putting up guard rails on a steep, high mountain ledge. Safer, but it’s not quite the same view. The world is less threatening and scary, for sure, if we get rid of all the thorns–if we eliminate the wolves and cougars, spray Raid on the wasp nests, Round-up the poison ivy. Safer, yes. But it’s not quite the same. What’s a rose without the thorns? Oops, pressed send too soon… I agree about safety issue. We need to be safe, but not unconscious. Keep lead out of our kids’ toys, but let play on the playground where it’s safe to take risks. Trying to take out all dangers from our lives leaves us in more danger when it appears and we don’t know how to deal with it. OK, I’ll get off my soapbox now. Bye. interesting. The power of science is amazing eh? I always wondered what kind of tree those pods come from! Never bothered to investigate them and am embarrassed to say, never even thought of shaking them. The grandson (and I) can’t wait to do that – and to check for fangs! (Wow – nails?!) Love the tree’s “back story” – reminds me of The Princess and the Pea. And what’s that saying – the more we gain, the more we loose? Let them dry out well, and then give them a shake–great scratchy kind of sound. That’s funny, I never thought of that–it’s the princess and the pea story in reverse!